I have tried changing the display options in my control panel, but I cannot get topics to display according to whether or not they have new posts, that is, all topics with new posts should be shown at the top of the list, with topics without new post shown below, as is the case with all other forums I visit. Any ideas as to why this is? Thanks for raising the issue. I'll do some research and get back to you. I see that it is still not possible to order the display of posts on the forum. Can this not be corrected? Thanks. I'm sure Dave will reply but I do know we are limited by the functionality of the phpBB software that we use. (Maybe a quick Google will help find the answer and if successful post it back here so Dave can look at it). I find the daily digest email facility very useful - means you don't have to check the board every day to keep informed and it does list new posts in order. There's a tab under user control panel to set it up. Thanks for your reply to my post. I'll give the daily digest a go. Sorry that I haven't made any headway with your request; it does not seem to be something that I can simply turn on as an Administrator. I suspect that it needs a new mod or extension. I use the RSS feed to keep track of all new posts. That means that you don't have to wait for the daily digest. Thanks for your reply to my question. I'm sorry to hear that there's nothing you can do to resolve this problem. Thanks for investigating it. 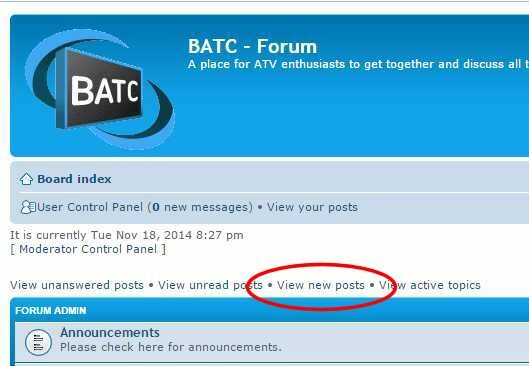 Have you tried clicking the "View new posts" link on the forum home page? No, I haven't tried that but it would show all new posts, not just the ones I wish to read! I will give it a try, though. Thanks for your suggestion.